Lizard Head Cycling Guides offers a growing number of mountain bike (MTB) tours through some of the most amazing terrain the west has to offer. In 2016, we have expanded our mountain bike rental fleet with the addition of Scott Genius 720 Plus Chubby Bikes for an off-road experience like no other! Why do a Mountain Bike Tour with Lizard Head Cycling Guides? CLICK HERE to Find Out! Below is our current list of MTB tours. Please check either the Spring/Fall Tour Calendar or the Summer Tour Calendar for confirmed departures. Big Bend Texas MTB Tour – New for the 2016 season is our Big Bend Texas MTB Tour where we explore some of the most remote terrain in the desert southwest region of Western Texas in Big Bend National Park and Big Bend Ranch State Park. Colorado Trail MTB Tour – Our Colorado Trail Mountain Bike Tour is a dramatic back country odyssey traveling the Continental Divide and Southwest Colorado on a point-to-point mountain biking journey. 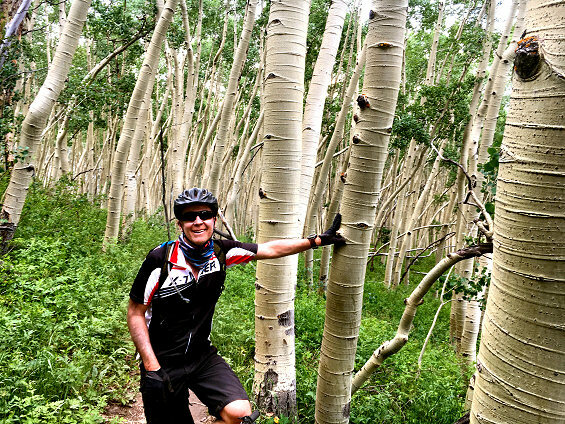 Crested Butte Singletrack MTB Tour – This 6-day tour offers immensely beautiful, challenging and remote terrain in the Elk Mountains of south-central Colorado and Crested Butte. Great Allegheny Passage/C&O Canal Gravel Tour – A long distance 5-day car-free gravel tour along two of the best back-to-back gravel trails in the US – The Great Allegheny Passage and the C&O Canal – from Pittsburgh, PA to Washington, D.C.
Moab Road & MTB Tour – A “hybrid” road/MTB Moab area tour through the supernatural landscapes of Arches & Canyonlands National Parks, the challenging La Sal Mountain Loop Road and beneath the 800-foot tall red sandstone walls within the Colorado River Canyon. Grand Staircase Utah MTB Tour – An offroad tour in the remote back country around Capital Reef National Park, the Waterpocket Fold and down the switchbacks in Burr Canyon. Hayduke Trail MTB Tour – An audacious 434-mile/14-day mountain biking journey across Utah’s most remote, most wild and most rugged other-worldly back-of-beyond terrain.